I pointed out earlier that in 2 Timothy 3:16-17 Paul writes that all of God's Word is "profitable for teaching, for reproof, for correction, and for training in righteousness." I want to emphasize again that this admonition includes God's Prophetic Word. Also, in 1 Thessalonians 5:20 the apostle Paul pleads with us to treat prophecy with respect: "Do not despise prophetic utterances." A good example of what I'm talking about is the "Jesus Seminar"4 that began meeting in 1985 and whose work culminated in 1993 with the publication of a book titled, The Five Gospels: What Did Jesus Really Say?5 The seminar was composed of forty New Testament "scholars" from a great variety of Christian seminaries in America. The seminar met every six months to vote on the sayings of Jesus as recorded in the four ospels. The goal was to produce a new version of the gospels in which the sayings of Jesus would be color coded: red, if He said it; pink, if He may have said it; grey, if He probably did not say it; and black, if He definitely did not say it. They titled the evil fruit of their labors, The Five Gospels, because they concluded that the spurious Gnostic Gospel of Thomas6 was as valid as the four Gospels adopted by the early Church Fathers. God's Prophetic Word is food for our spiritual growth. We need to take it off the shelf, open it up, and feast upon it — and we need to do so with believing hearts. Bible prophecy, properly taught, can literally transform a person and a congregation. This will happen if the person or congregation can be convinced of two things regarding prophecy: 1) Jesus is returning, and 2) His return could occur any moment. Regarding the first point, most Christians believe with their minds that Jesus is returning, but they do not believe with their hearts, and therefore their belief has no impact on their behavior. Regarding the second point, most Christians are unaware that the return of Jesus will be in two stages — first, the Rapture, and then the Second Coming. Because they know little or nothing about the Rapture, they have no understanding that the Lord could truly return at any moment. They believe that many prophecies — like the preaching of the Gospel to the whole world — must be fulfilled before the Lord can return, when the truth of the matter is that there is not one prophecy that must be fulfilled for the Rapture to occur. Again, if a person or congregation can truly be convinced that Jesus is returning any moment, they will be transformed because they will be motivated to share the Gospel with others and to commit their lives to holiness. A commitment to evangelism and holiness! What more could a pastor hope for? Bible prophecy does not just relate to the future. It has an important spiritual relevance to the way we live our lives in the present. In the last segment of our topic concerning the importance of Bible prophecy, I'll give you some key scriptures concerning the value of prophecy. 4) Birger A. Pearson, "The Gospel According to the Jesus Seminar," www.veritas-ucsb.org/library/pearson/seminar/js1.html. 5) Robert W. Funk, The Five Gospels: What Did Jesus Really Say? The Search for the Authentic Words of Jesus (New York, NY: Harper One, 1996). 6) The Gnostic Society Library, "The Gospel of Thomas," www.gnosis.org/naghamm/gosthom.html. Very well said and right on time. I have encountered the attitude you have spoken of here and what is totally beyond reason, most of these people that deny the soon coming of our Lord and Savior, they can't see what is taking place today as fulfilling prophecy. I guess the Pharisee Yeast has infected a lot of people and we all know where that comes from. If there is no prophecy that must take place prior to the Rapture then why do so many scholars including Dr. David Reagan identify the Church as the Restrainer preventing the appearance of the AntiChrist on the stage? The Church in all of history never prevented the rise of evil dictators or evil, the Church only serves to be ambassador's of the truth, a light in darkness! Under these guidelines, we know that the AntiChrist could not come to power without the technology to control global commerce and monitor the financial status of every individual on this planet! We also know that Israel was required to become a nation and be in control of Jerusalem and the Temple Mount that the Temple would be built and sacrifices again instituted! These are but a few items required for the AntiChrist to rise to power along with the demise of the current financial system of the world and full blown apostasy! It is reasonable to conclude based on these parameters that if the Church indwelt by the Holy Spirit is what prevents the appearance of the AntiChrist, then obviously the Rapture could not be considered imminent as frequently taught today! For any event to have not taken place in about 2,000 years and still be considered imminent is rather amazing to me! The suggestion presented by scholars today clashes with the scriptures for the Lord will not appear as a thief to believers yet for those that do not believe. We are to watch and be sober observing those things that identify clearly that the time of wrath is approaching and that our redemption of the body is near for we are not subject to wrath! Apostasy is here- Jesus' "coffin" has been discovered? Jesus was never buried. What??!! Please Lord Rapture out of this looney tune world. God Bless! Also Rodney imminent does not mean immediately! It just means at anytime,so all can have the same chance to be ready and waiting. Anon, that is a correct analysis, that it is not immediate, yet to expect it at any moment identifies that we ignore certain elements in scripture that must take place prior to the Blessed Hope! I'm sorry to see prophecy used as a lever to manipulate people to do something. Understanding Christ's LOVE is the only true motivation, and Christ is the only thing that empowers us to live uprightly. When will we stop brow-beating people into witnessing or living "right"? If we properly teach the believer's identity in Christ and what He has already done for us (i.e., made us complete and lacking nothing, given us everything we need for life and godliness, etc. ), you can't STOP people from witnessing and serving and loving others. Stop! Please stop with the manipulation. It's sickening! imo you are mistaking PREVENTION with restraint. Katecho in 2Thess 2:6 means to ‘keep in check’ or hindering (from evil being worse than it could be.) Katecho doesn’t suggest to actually stop evil from happening at all. That only happens when the Eternal Kingdom is set up after the millennium. The katecho is evidence of God’s Grace and mercy to the world while the Church is still present. When she has been removed from the earth, katecho will stop and evil will have full sway during the 7 years. Yet even then, there will be evidence of God’s Grace and Mercy as a multitude put their faith in the Messiah to save them from eternal death. While it is true there are no prophesies for the imminent Rapture (not ‘soon or immediate’, just not known) There are many clues that the 7 years of Tribulation is fast approaching. It is the approach of this event that we can now see in our newspapers. Vital to events is the re-emergence of National Israel living in the land. This is evidence that the imminent Rapture cannot be delayed for much longer before the Body is snatched up to be with the Head. The Rapture event is not dependent upon modern technology in any way shape or form. I find it sickening that born again believer’s aren’t being encouraged to do as The Word instructs; to acknowledge sin in ones life, confess it as in 1John1:9 to ensure FELLOWSHIP is renewed with The Father. This is how Antinomianism has grown resulting in unchecked godless behaviour and severe attitude sins in the majority of the Church that will result in a multitude of ‘brands plucked from the burning’. Saved – full stop – I’m alright Jack, pull the ladder up - with no fruits deserving reward when Christ judges our works done in the flesh or spirit. FAITH without WORKS; is a dead branch fit only for the fire. This isn’t about works for Justification which is a free gift and no works. To grow IN Christ for Sanctification requires discipline and obedience to God’s Word which results in our ‘being changed’ to become like Jesus. Learning to ABIDE in the Vine is not being taught or even taken seriously. It is only when we actively Abide in the Vine, that we are then UNABLE to sin. This WILL matter, a great deal at the Bema; and those teachers who have neglected these instructions to their flock have to give an account to Christ for this neglect. These teachers will lose out the most. We don't have to do anything other than believe in Jesus for salvation. But...do you deny JESUS WANTS us to live holy lives? When I sin, I feel miserable, guilty, empty, ashamed and hurt. NOT because I don't think I have salvation anymore. But because I sinned and I KNOW BETTER! I KNOW how Jesus wants me to live and I failed. I know I disappointed Him...again. THAT is what hurts so much. Knowing I disappointed the Lord by not living as HE wants me to. Should I NOT feel those things? How could I not?! I love Jesus as my Savior. I have given the destiny of my soul to Him. He is the most important person in my life. He sacrificed HIS LIFE for me! So how could anyone NOT feel anguish over ones sins unless you are a completely unfeeling, uncaring amoral individual. I know my sins are forgiven. I know I won't be held accountable. I know I can repent and be joyful that the fires of hell I deserve will never burn me. And that is why I GET OVER those feelings and get back to a place of hope and joy over God's grace. I pray the day will come quickly when we will at last be all together with the Lord, when there is no more sin and no more tears. But until that day I have to deal with being trapped in the flesh which is weak...which leads to my ultimate conclusion...the best way to deal with the current situation I am in (a sinner in a body of flesh) is to TRY AS HARD AS I CAN TO LIVE AS THE LORD COMMANDS because when I do, at those times, THEN AND ONLY THEN am I truly happy and truly free. Sorry Rodney, but did you overlook Matthew 5:13, or do you also have a private, uni-que interpretation of that too?? "Ye are the salt of the earth: but if the salt has lost its savour, wherewith shall it be salted? It is thenceforth good for nothing, but to be cast out, and to be trodden under foot of men." I don’t have a political head to put on my shoulders, but hopefully you will understand this about the IMPERIAL Roman Empire? Imperialism is what made Rome diverse from the previous three Empires that Daniel named. Apparently Imperialism is the highest form of Capitalism and this is precisely how the A/c will rule, exactly as ancient Rome ruled. Ancient Rome had control over ALL commerce and finance within its Empire achieved through Roman citizen Procurators. This is why your conclusion about the need for modern technology to be in place to enable the A/c to govern the world’s finances is completely without foundation. For whatever reason best known to themselves; God had given Babylon a grant to govern the entire earth, but, they didn’t take it up and limited themselves to their final boundaries. This was also true of the Media-Persians who ‘took over’ from Babylon. Even Alexander the Great of Greece was limited in his area of conquest, and the same thing happened when Iron Imperialistic Rome took over, as their rule did not extend over the whole earth at that time, even though their ‘ancient’ system allowed for it. Through the final Imperialistic rule of Rome through the A/c; it will finally achieve the grant given by God and rule the whole earth with 7 of the 10 ‘Procurators’ in assistance. The point being that even at the time of the Apostles, prophecy could have been fulfilled. Modern technology was not necessary. God doesn’t NEED T.V. He has the entire sky to screen His productions, day and night. As for the requirement for Israel to be ‘in the land’! This is true, but as I have previously said, the Jews of Israel were ALREADY in the land at the time of the Apostles, so nothing to prevent the Rapture or the Tribulation being fulfilled at that time. Events can turn on a sixpence, quickly and suddenly all requirements could be suddenly met – whatever, the timing of the imminent Rapture is not affected with Israel being either in, or out, of the land. Rodney said "For any event to have not taken place in about 2,000 years and still be considered imminent is rather amazing to me!" You miss the point completely. Israel IS in place. Technology IS in place. Middle East chaos IS in place. Gog/Magog IS in place. The East army of millions IS in place. Two witness being broadcast worldwide IS in place. Economic collapse IS in place. Church apostasy IS in place. Nuclear war IS in place. I could go on and on. All the things that are going to happen in the end days are here now or in place to happen. You can't argue that. So, what difference does it make if none of this was in place for the past 2,000 years? IT IS NOW! And BECAUSE IT IS that means first domino to start the end times fall of the rest of the dominos CAN happen at any time. AND THE RAPTURE IS ONE OF THOSE DOMINOS! Therefore, anyone being intellectually honest would admit that yes, the Rapture, is more imminent at this time in history than it ever has been before. Billy said "And BECAUSE IT IS that means first domino to start the end times fall of the rest of the dominos CAN happen at any time." That has to be my worst sentence ever posted! Maybe the worst of my life! I have to read before I post, not after. It should have said to the effct of "And because it is, that means it IS imminent that the first end times domino can fall at any time. The rest of the end times dominos will fall thereafter. The Rapture is one of those imminent end times dominos." You sound like those that knew of the prophecies of the coming of Christ but did not recognize Him when He did come. They knew of the prophecies of the coming of the Lord. Yet so much time had passed before Jesus came. So they were unable to read the signs of the times that said "The time has arrived. This is the Christ." They were in denial and so are you. The time of the end has arrived, Rodney. Open your eyes to that fact. It's all going to happen soon. Everything is in place. The Rapture, Gog/Magog, anitchrist, all of it. It's here, Rodney. IT'S IMMINENT! Billy, trust me, I know we are in the "Final Days" and our expectations will finally be realized when the "Blessed Hope" occurs! We still have much work to do while it is still light, for the darkness is quickly approaching! While Laura felt prophecy was used as a lever to manipulate people to do something, I feel it is being used as a lever to MOTIVATE people to do something- the most important thing anyone could ever do, which is to tell people about Christ. There are many out there who do understand God's love, but don't feel any urgency in sharing this with loved ones because they have been told that bible prophecy is not real- just something the religious looneys believe. Additionally, if they have been told that large portions of the bible are not true or are just symbolic etc., then they are probably not really concerned about people of other faiths because they likely have also been told that many paths can lead to God through some other spiritualization of the bible. You see, Laura, IMO it's not only about knowing the love of God- its also about knowing the whole story. Some don't truly understand that their dearest loved ones and friends could be doomed to hell at any moment. It's not that they don't know God, its that they don't have enough of a motivation to break out of their comfort zone and risk ruffling a few feathers, or creating an awkward situation, or becoming an outcast among friends etc. I don't feel manipulated at all by someone just reiterating what the bible tells us to do over and over again! With all my heart – Amen! 1John5:3 THIS IS THE LOVE OF GOD, that we keep His commandments. And His commandments are not burdensome. 2John1:6 THIS IS LOVE, that we walk according to His commandments. This is the commandment, that as you have heard from the beginning, you should walk in it. Agape Love insists we do as Paul did, and tell about the WHOLE Counsel of God. There was a time when the 1st Coming was unfulfilled prophecy and nobody talked about that much – just like the 2nd Coming today; very soon now, and it will also be fulfilled prophecy, and too late for talk. Still thinking of you and praying. 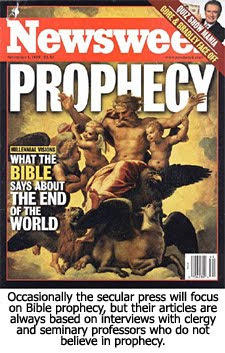 Rodney said "Billy, trust me, I know we are in the "Final Days"..."
Since we are in the final days, and the Rapture is part of the final days, I guess one could say Rodney has finally admitted the Rapture is imminent.